2010 was a busy year for SMRS, in particular for a certain chairman with the start of a fifth decade to celebrate. So no excuses for starting consideration of the sleeper trip even earlier than before. A return to the Fort William sleeper and the Jacobite steam excursion was a possibility, with options of either the Speyside and Keith and Dufftown railways, or a ferry trip to Barra via South Uist or Oban and Mull. 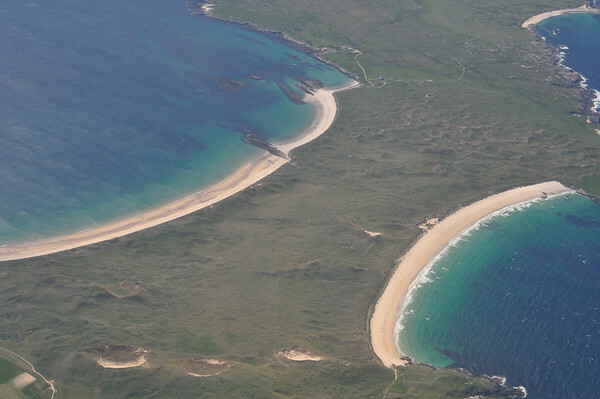 The Barra options might include a flight to Glasgow on the homeward leg, with the added attraction of a beach take-off. Despite trying to limit the choices (no point in confusing the electorate with too many) in the end there were more options than could be easily reviewed all at once, even at a specially-convened subcommittee. This was attended by five interested parties, with the chairman absent in person but adding his not-inconsiderable persuasive authority courtesy of a mobile phone conference call.Despite significant interest in the eastern option, to Aberdeen and the Keith and Dufftown, the call of the Isles was not to be denied. The sleeper trip programme development manager (create your own acronym) was given clear instruction to progress a North Uist/Barra itinerary. 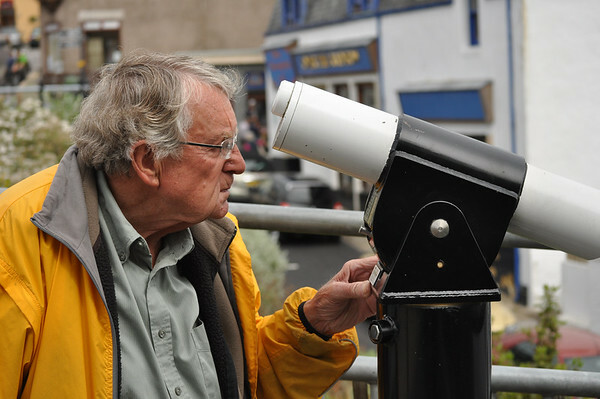 The relative merits of buses and boats were discussed at length, taking due account of the likelihood of stormy weather in the Little Minch, even in mid-June. The eventually-preferred route involved some of each, going overland across Skye to take the ferry from Uig to Lochmaddy. 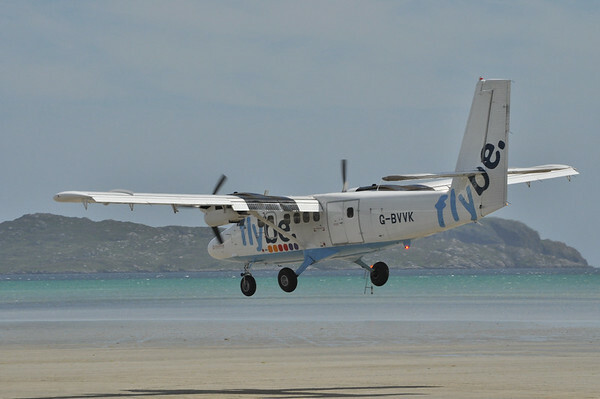 The return would be by plane, taking in the world's only scheduled flight using a beach as a runway, at Barra. A neat complement to our experience of the shortest scheduled flight in Orkney in 2008, assuming that global warming didn't cause too much of a rise in sea levels between planning and execution. After the trauma of route selection, I was hoping booking would be straightforward. However the fairly small amount of B&B accommodation on the Outer Islands, and the need to accommodate six men in six beds, made it less than simple. Visions of us being scattered far and wide across each island, or alternatively of being forced to stay in luxury hotels significantly above our normal means, looked to becoming a definite reality. And the price of the air tickets, once fees and taxes were added, suddenly looked less of a bargain that they did earlier. However, such problems were just there to be solved, and we seemed to be just about there. Some splitting up of the party was necessary, but at least it looked as if we would be able to reconvene for evening sustenance and entertainment at each location, and just about afford it too. And then there were five. Shock, horror the chairman failed the initiative test and bottled out of team selection. Some pretext about a sudden training course for some government-inspired savings scheme. A likely story, but being loyal servants we swallowed it without audible question, cancelled a selection of pre-bookings and reformulated the finances. Fortunately the deputy chairman was still on board, so a strong element of leadership remained to guide us through. The departure was comfortably routine, with all five reporting for kit inspection at the appointed hour at Southport station, with barely a Hawaiian shirt in sight. We were spoilt for choice, with not one but two Pacers vying for our custom, with spoilt being the correct description. 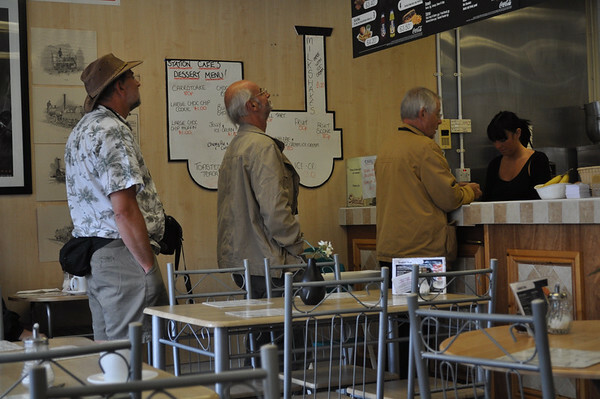 Wigan arrived not a moment too soon, and we made our usual bee-line for the Station Cafe, for either first or second breakfast, depending on time of getting out of bed. A quick station-change was slowed somewhat by the presence of a larger-than-normal quota of railway police and Virgin staff, or militia as they prefer to be called. Even dog handlers were in attendance. Wondering if this was a guard of honour or a security tip-off, we tip-toed past the serried ranks of officialdom, showed more tickets than was strictly necessary at the barrier, and climbed aboard the London train, which seemed surprisingly full for the time of day. Euston arrived on time, allowing us the luxury of several hours in the metropolis. Not of course to be frittered away in frivolous shopping or pointless sightseeing. The Mayor of London's Trainset beckoned, better known to some as the London Overground. In theory a more-or-less complete circumnavigation of middle London suburbia was possible, although this might require more dedication than we were capable of summoning up in advance of a sleeper journey. The left-luggage office was briefly visited, but just as briefly dismissed due to the £8 per item charge. It would stay with us, and we would learn the value of travelling light. First stop was Highbury and Islington via the Victoria line, then the LO itself to Dalston Kingsland (where?). Dalston Junction was but a short step away, albeit slightly damp and surrounded by a combination of construction activity and variable-ethnic market commercialism that some might describe as eclectic. More Overground, this time due south through somewhat miscellaneous city scenery to Crystal Palace. Here amongst impressive but not particularly user-friendly brickwork, a decision needed to be made on the next stage. Several routes westward were possible, but only one, or at the most two, had the magic word 'tram' in their itinerary. A quick check on the validity of our travelcards and we were off to Beckenham, the north-eastern extremity of Tramlink. 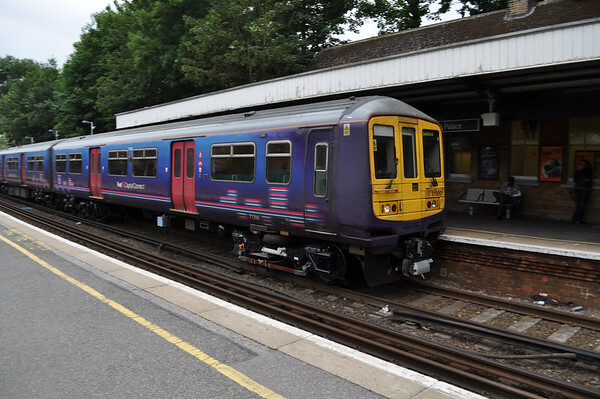 From there we traversed the length of the line, carefully avoiding Croydon of course, and eventually arrived at Wimbledon. Fighting our way through a mix of urban commuters and early-evening pleasure-seekers, we found a likely-looking Italian restaurant and declared dinner to be served. The final stage was another novelty, a First Capital Connect train aiming for Luton but going the pretty route through central London, across the Thames at Blackfriars to St Pancras International. A brisk walk westward along Euston Rd took us to our bed for the night. The sleeper also seemed to be busy, and as is often the case we had to walk virtually the length of a long train to get to our cabins. In the lounge car appropriate refreshments were sought, and eventually obtained as we sped northward. Next morning the sun was up early, illuminating fine highland scenery as we headed into Fort William. The Jacobite was ready and waiting, also full to the brim and with kilted piper in full flow. The Black Five in charge behaved impeccably and we reached Mallaig on time. 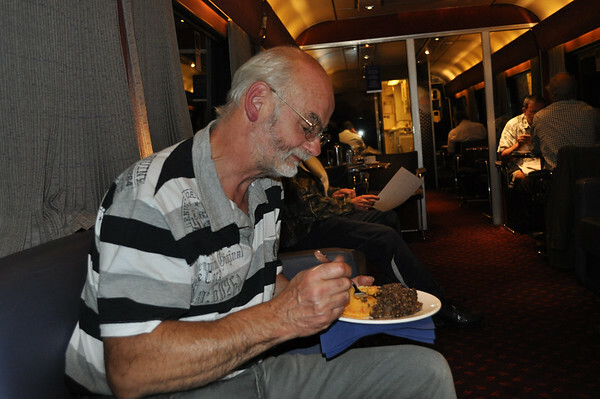 Lunch was taken on the hoof, to allow more time for exploring, in particular for identifying the sleeper accommodation for later than night. The steam train took us back to Fort William, in different seats, and the service train then returned us to Mallaig, where we split up for three different B&Bs. That evening we had a more than passable meal in the Marine Hotel, to the surprise of at least one of our landladies, who darkly hinted at a 'reputation'. A stroll around the harbour revealed some interesting wildlife, not only a seal in the water but an otter out of it, taking fish left on the deck of a fishing boat by an obliging crew member. Next morning we assembled for the third ferry of the day to Skye, the first two being discounted because a) the bus didn't meet either of them at Armadale and b) it would involve getting up earlier than strictly necessary. An uneventful crossing was noted only for presence of a bright red Morgan in pole position on the car deck, adding a touch of class to an otherwise rather ordinary collection of vehicles. The bus took us to Portree, where the afternoon was free for freelance adventures in the steadily-improving weather. By general agreement this would take the form of a boat trip to view the local aquatic wildlife. At first the cost quoted was a little daunting, but the salesperson recognised the significant age of most of the party and also that five in a boat were worth more than any number on the dockside. So a bargain was struck, and an al-fresco lunch consumed on the quay whilst we waited our turn afloat. The boat looked a touch smaller than the brochure suggested, and the safety drill a little on the brief side, whilst covering all the main points, including the all-important one that the water was cold and not to be entered if at all possible. The skipper was clearly a man of knowledge and experience, and soon had us alongside a stretch of cliff on which perched an impressive-looking sea eagle. Attempts to entice it to fly by tossing fish in its direction resulted in complete indifference on the part of the eagle and a noisy fight on the part of two herring gulls, who knew a free lunch when they saw it. 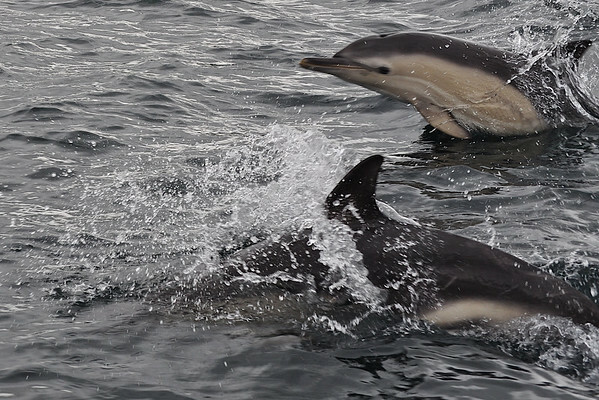 We then navigated at some speed south-eastwards into the Sound of Raasay on the strength of rumours of dolphins, and were eventually rewarded with a number of splashes in the distance that were clearly mammalian in origin. As we and two other boats approached schools of perhaps a dozen or so circled round us, timing their appearance to just miss the clicks of numerous camera shutters. Much photography of blank sea was achieved. On the way back had another look at the eagle, now perched by the nest higher up the cliff, and also passed a series of large circular fish farms. The technology apparently included food-firing pellet guns to deliver sustenance little and often, thus avoiding a pile of left-overs to accumulate on the sea-bed. A solution ripe for introduction into the child-rearing business. Back on dry land there was time to watch the world go by in the town square before the bus came to take us to Uig, driven by a lady with a strong sense of mission. The ferry to Lochmaddy was reached by a breakwater just long enough for us to be grateful for the minivan offered as courtesy transport. The weather started to mist over a little, giving added drama to both landscape and seascape, but fortunately not having any significant effect on wave heights. No Morgans this time, although one car did have a red canoe perched on top. Once cast adrift we went in search of the wardroom promised as far away as the ferry office in Mallaig, and as long ago as yesterday, and found it open and serving hot dinners. A pleasant two-hour cruise later North Uist grew on the bow horizon and we were manouvered alongside the modest jetty by a captain clearly well familiar with putting either left or right hand down a bit, as the situation demanded. As the evening was well advanced the priority was to find the accommodation reserved for us. A walk up through what seemed to be Lochmaddy's one and only street found both establishments in fairly rapid succession. One seemed to be more self-catering than B&B, particularly at breakfast time, whilst the other was formerly the local courthouse, complete with walled garden for the better containment of the local miscreants. Just across the road a new-looking hotel beckoned, the Tigh Dearg, which hosted an impressive collection of the national liquor. On the return journey we diverted a little to try our hand at low-light camera work across the local jetty, it being almost dusk at almost midnight. Next morning after breakfast, cooked or raw depending on location, we set off to explore the environs of Lochmaddy, guided by local information that a pleasant walk could be obtained beyond the Tigh Dearg in a circular fashion. The degree of dampness underfoot, and occasionally in the air, encouraged a shorter version that still succeeded in testing the waterproof qualities of our footwear to the limit, and in some cases beyond it. Highlights of the tour included a circular stone igloo, far too new in appearance to be an ancient dwelling-house, that later research was determined to be a camera obscura. So obscure in fact that we never twigged it at the time. Also on the itinerary was a wooden suspension bridge and Sponish House, a somewhat run-down mansion built 200 years ago for the local sheriff. We circled back to the hotel for a welcome coffee, and wandered back down to the harbour, via the local museum and shop, to wait for the bus to the airport. This was on Benbecula, not to be confused with either North Uist or South Uist, between which it lay. First to arrive was the local post bus, whose driver offered to take us but with the honest appraisal that the journey would be both shorter and more comfortable in the proper bus, which was but five minutes behind. We decided to wait, and had the shorter and comfier trip across the island and the barely-discernible bridge (or was it a causeway?) to the airport. There we checked in for Barra and settled down to wait for half-an-hour or so until the flight was due. This was rudely interrupted not once but twice, as the polite but determined security staff selected not one but two of our party for random baggage searches, no doubt using some complex formula involving thinking of a number between one and five, twice in quick succession. Altogether about nine or ten passengers squeezed into the De Havilland Twin Otter for the short trip south to Barra. The flight was remarkable not only for the scenery but also for the beach landing, which was accomplished with the aplomb of a pilot who has done it many times before and who regards bumping over multiple worm-casts merely as an environmentally-friendly way of maximising runway grip. The spray from residual tide-water just added to the interest. We disembarked just in time to miss the bus to Castlebay, but were assured there was another a few minutes behind. True to form it appeared, piloted by a driver whose customer service battle honours were clearly born of natural island breeding rather than of an anonymous training course delivered in the back room of some soul-less Glaswegian urban hotel. Not only did we manage to underpay the fare, but we were cheerfully delivered right to the door of our chosen B&Bs, both involving a diversion off the bus route and one a three-point turn on a narrow road. 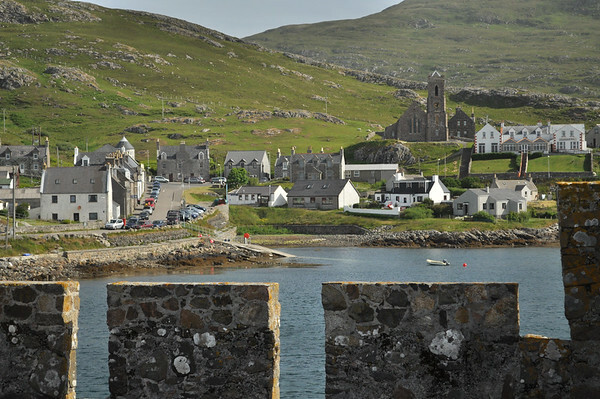 Castlebay turned out to be an attractive well-appointed small town on a scenic island. After a quick spruce-up we set out looking for sustenance. The local Indian eating-house was closed, which was a pity because it claimed to combine both sub-continental and Italian cuisine, a combination well worth exploring, although perhaps not on the same plate. Instead we went up-market in the Castlebay hotel, which claimed to be the best dining experience in town. Almost certainly the most expensive, but on balance judged to be good value. As the evening drew to a close, and the light even began to dim a little, a shadowy shape approached the jetty. This was the ferry from Oban, at the end of its seven-hour journey. 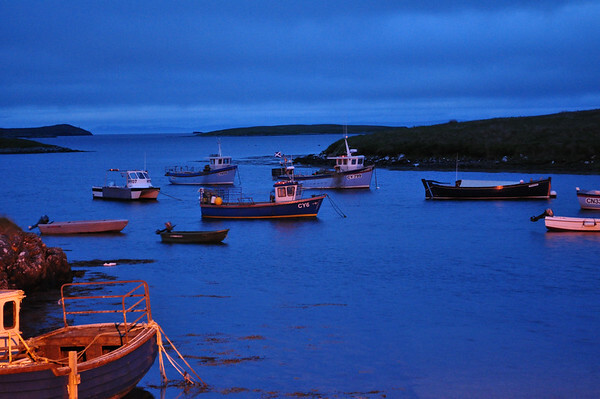 Next morning was unscripted, allowing us to choose how to explore the attractions of Castlebay. We elected to visit Kisimul castle, the home of the chief of the MacNeil clan. This had a moat of some considerable proportions, namely the whole of the bay, the bay of the castle in fact. Whilst waiting for the boat to take us across, various buildings were pointed that had starring roles, or at least significant bit parts, in the making of Whisky Galore in 1949. The castle itself was interesting rather than excessively fascinating, with a number of medieval features that held the attention long enough to elect to stay longer than the first available return journey. Distinctly un-medieval was the helicopter that took off from the edge of the town while we were there, its yellow livery indicating its function as a flying ambulance. Lunch was taken on the patio of a small cafe overlooking the bay, consuming sandwiches which the vendor correctly described as 'not your average Tesco'. The bus to the airport was driven by the same driver, giving us the opportunity to equalise the fare structure we had created the night before. He seemed unfazed, and perhaps even a little disappointed that he had no opportunity to divert from his route to serve us better. So much so that half way there he exchanged vehicles with a female driver coming the other way, and returned whence he had come. Back on the beach we soaked up the sun, finished off lunch and waited for splashdown of the Glasgow plane. Its landing was well worth the wait, as was the scenery revealed as we flew south-east over such exotic isles as Coll, Tiree and Mull, and quite possibly Muck and Eigg as well. A combination of clear weather and limited altitude meant that the landscape did actually resemble Google Earth's representation, albeit without the zoom facility. 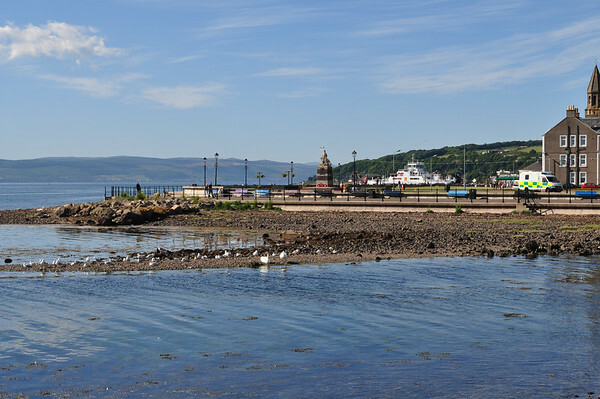 A bus to Paisley station was ready and waiting outside the airport, and we entrained for our final destination, Largs. The final B&B was within a stone's throw of the station, although we managed to reach it via a somewhat larger slingshot. The proprietorix was welcoming and Rumanian, and encouraged us to make full use of the facilities, including our second resident's lounge of the trip. However we had more important matters to attend to, namely to find a suitable venue for eating, drinking and watching England's stumbling performance through world cup qualifying. The first two requirements were easily met, the third was somewhat frustrating. The final day saw us back at the station aiming for a seven-minute connection at Glasgow Central for the train to Preston. We made it without undue alarm, and once the seat bookings were sorted out we had an uneventful trip back home, the final leg courtesy of the Stagecoach X2 omnibus. Planning has already started for next year, the new man promising a fresh, vigorous approach to executive sleeper trip management. In reality, more of the same will do nicely.